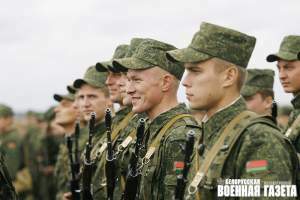 BelarusDigest > Security > Have Belarus’s neighbours convinced its military to open up? Have Belarus’s neighbours convinced its military to open up? Minsk continues to face fall–out from the West-2017 military exercises. 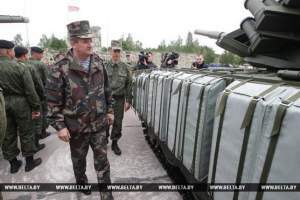 Earlier this month, Russian media outlets, such as Nezavisimaya gazeta, criticised Belarus for “excessive openness” in allowing foreigners to observe its military drills. Remarkably, this openness in regards to military drills corresponds with signs of increasing openness inside Belarus itself. On 1 November, Tatsyana Karatkevich and Andrei Dzmitryeu, leaders of the Tell the Truth social movement, met a group of leading Belarusian military officials to put forward proposals to solve various issues facing the national army. Even the Chief of General Staff, Aleh Belakoneu, was at the meeting. Top military officials meeting with opposition activists is unprecedented in Belarus. Indeed, the 1 November meeting is the latest in a series of moves by the Belarusian government, which seems to be cautiously taking steps to make the Belarusian military more transparent. Now, officials in Minsk are responding to negative incidents not simply by meting out punishment against perpetrators. It appears the army leadership want to enable soldiers to communicate more freely with the world outside the barracks, promising open investigations and installing new technology to help prevent abuse. On 3 October, a soldier in Barysau most probably committed suicide, because of mistreatment. The army, and even Belarusian President Alexander Lukashenka, responded to the incident with more attention than in previous cases. The reaction may go to improve transparency and responsibility in the army. On the one hand, Lukashenka fired the head and other officers at the facility where the victim had served. In fact, the army began checks of all local commissioned and non-commissioned officers at the facility. So far, a dozen military personnel have been detained. On the other hand, the Defence Ministry is expressing a willingness to keep the public informed. On 25 October, the Defence Ministry issued a statement in which it offered guarantees that the public would get all the details of the Barysau investigation. Never before have the Belarusian armed forces seemed to care so much about public opinion. Likewise, on 8 November, the media reported that henceforth soldiers serving at the Barysau military facility would be allowed to carry mobile phones with them at all times. Previously, soldiers were allowed to use mobile phones, however, their phones were stored in specially designated areas, which meant they were inaccessible most of the time. The Defence Ministry praised the decision by Barysau facility’s commander and, thereby, appears to support introducing this more liberal regime at similar military facilities. Earlier on 4 November, answering questions online, Defence Minister Andrej Raukou said that ICTV cameras would be installed in barracks to help prevent mistreatment and abuse. The minister’s decision to communicate with citizens directly online also appears to be a response to the tragic events that took place in October. 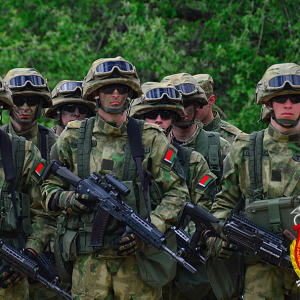 Is the Belarusian army about to open up to NATO? In a similar vein, the Belarusian government has for some years struggled to demonstrate its peaceful intentions. On 3 November, Moscow-based newspaper Nezavisimaya Gazeta criticised the “exaggerated openness at the West-2017” military exercises. Indeed, Minsk made a point of pursuing its own policy with regards to the exercises. Unlike Moscow, people were invited to view Belarusian maneuvers: it invited more than 80 diplomats and admitted almost 280 foreign journalists to watch Belarusian parts of the exercises, in which about 10,000 soldiers participated. The Belarusian government believes this level of openness has paid off. OSCE observers from Norway and Sweden on 20 September told Verdens Gang—which otherwise reported on the joint Belarus–Russia military exercises in a highly critical tone—that they had not found anything to condemn in Belarus’s own exercises. Indeed, Colonel Lieutenant Thomas Möller, sent by the Swedish Defence Ministry, called the question of whether neighbouring states have reasons to be wary of Minsk and Moscow “a political question.” That is, Minsk managed to secure relatively positive assessments of its drills from military professionals of influential Western countries. Minsk can see increasing military transparency as not just some abstract norm, but as an effective means of increasing mutual trust with its neighbours. The increased openness of the West military drills have, perhaps, helped produce a positive development in military relations with Ukraine. Kyiv invited two Belarusian military observers to watch the active phase of the Ukrainian-American Rapid Trident–2017 drills in September near Lviv. At our invitation, the military observers of Ukraine, as well as other neighbouring states, observed the active phases of all the main military exercises—beginning with Nyoman-2001 to West-2013… [While] Ukraine, within the framework of the Vienna documents in this period, has never invited military observers from Belarus to monitor the largest military activities conducted on Ukraine’s territory. [Even] the representatives of the Belarusian military attaché apparatus in Ukraine since 2013 have not been invited to any military multinational or national exercise conducted on Ukraine’s territory. The dispute between Minsk and Kyiv over observing each other’s military preparations continued as Ukrainian military observers in September fiercely criticised Minsk after watching the West drills. According to them, the exercise had been only “conditionally open” and offensive in character. Therefore, Belarusians observing Rapid Trident–2017 has become a major move to further improve bilateral relations. The examples cited above prove that the Belarusian state is transforming. Even the army is choosing to admit its shortcomings and deal with them. Some of these reform decisions have been taken because of tragic events, like the death of the soldier in Barysau on 3 October. Other decisions have been taken by officials perhaps after learning of positive practices in other Europeans countries. The Belarusian military’s decision to open up the West-2017 exercises after earlier seeing military drills in NATO countries supports this idea. Greater openness and responsibility will help to solve a host of problems. Inside Belarus, this can assist the army not only to become more efficient, but also to been seen as more professional and secure by citizens. Carrying on this sort of behaviour with other states, Minsk can so reduce tensions in the region. Will Azerbaijan help Belarus to become more independent? On 8 October 2017, Defence Minister of the Republic of Azerbaijan, Colonel-General Zakir Hasanov, visited Minsk. The visit lasted until 10 October. During the visit, Hasanov held meetings with Belarusian President Alexander Lukashenka as well as with all the senior military leadership of the country. The Azerbaijani guest probably made an agreement with his Belarusian counterparts on widening military industrial cooperation and supplying Baku with “Polonaise” multiple launch rocket systems. Azerbaijan deems the new weapons necessary to balance an Armenian military build-up. One should definitely pay attention to the structure of the visit. First, Colonel-General Hasanov met with President Lukashenka. The Belarusian leader’s words during the meeting were vague yet revealing. “I do not want to make excuses about the nature of our cooperation. I just want to say that our relationship does not in any case violate any international treaties or resolutions of the UN Security Council. We are sovereign independent states, and we are entitled to identify the areas of cooperation which correspond to the time and the needs of our countries,” stated Lukashenka. Such statements hint at serious intentions of military-technical cooperation, particularly in the supply of Belarusian “Polonaise” multiple launch rocket systems (MLRS) to Azerbaijan. 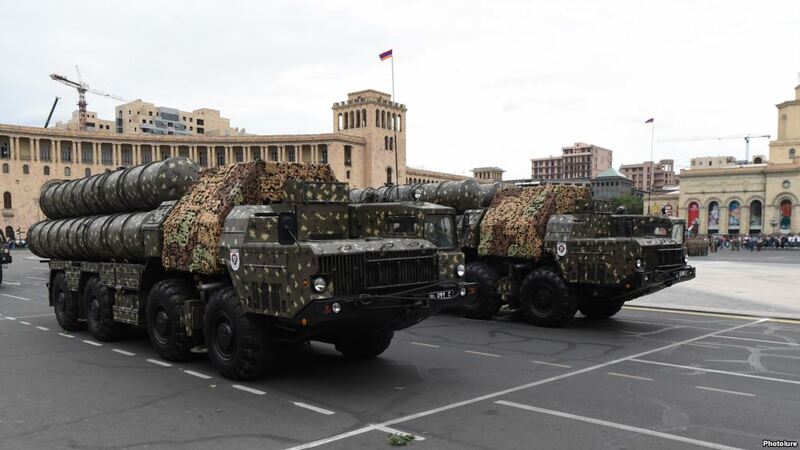 The arrangements have a certain logic: Armenia’s deployment of Russian “Iskander-E” tactical missile complexes on its territory has forced Baku to look for a symmetrical response. The “Iskander-E” tactical missile complex can reach targets up to 280 km away. Armenia thus has a missile range that covers almost all of Azerbaijan. With the latest modifications, the Belarusian “Polonaise” system is capable of shooting to 300 km. This modification was presented during the ADEX-2016 military exhibition in Baku last year. Azerbaijan has also shown interest in Belarusian developments in areas of electronic warfare, radar systems, wheel chassis and anti-aircraft missile systems. Having discussed the main issues of military cooperation with President Lukashenka, Colonel-General Hasanov spoke on more technical questions to the country’s top military leadership. 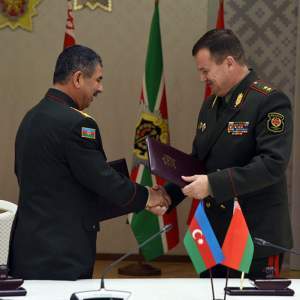 On 10 October, the Azerbaijani Defence Minister signed a military cooperation plan for 2018 together with his Belarusian counterpart Andrej Raŭkoŭ. As is usual in such cases, the details of the plan remain unknown to the public. On the same day, Colonel-General Hasanov met with Belarusian State Military-Industrial Committee Chairman Alieh Dvihalioŭ. In addition, Hasanov visited the Minsk Wheel Tractor Plant and the “Belspetsvneshtechnika” state enterprise, which, among other things, deals in arms exports. 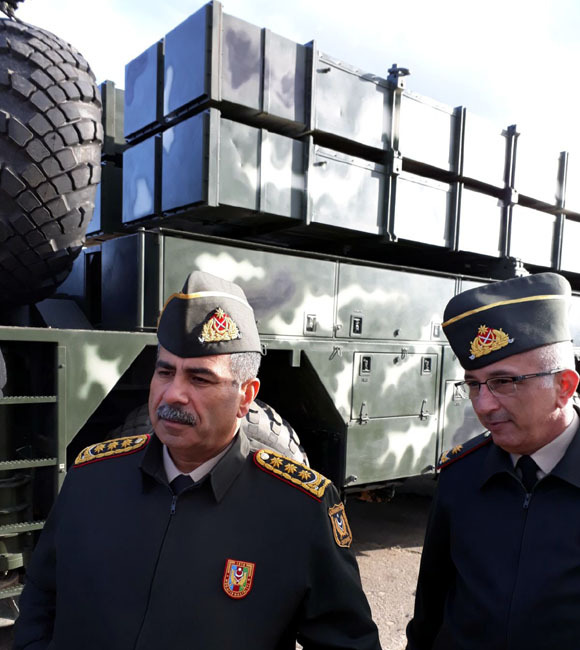 The Azerbaijani defence minister familiarized himself with the latest modifications to the MLRS “Polonaise,” as well as with air defence and electronic warfare means. At the final stage of his visit to Belarus, Hasanov held a discussion with Belarus Security Council Secretary Stanislaŭ Zaś. It is also important to note that Secretary Zaś met with the President of Azerbaijan, Ilham Aliyev, during his visit to Baku on 27 September 2017. Once again, military and industrial cooperation represented the main topic of the meeting. Supposedly, the Belarusian security council secretary came with a proposition to Baku and discussed the details with President Aliyev. The following step was Zakirov’s visit to Minsk in order to present Azerbaijan’s answer and sign the documents. While Baku mainly orients itself around military cooperation, Minsk is also hoping for the growth of economic relations between the two states. There is an assumption that the Belarusian military industrial complex might get financial support from Azerbaijan to develop and produce new weapons. With the economic slowdown Belarus is experiencing at the moment, such collaboration seems optimal for both states. At the same time, Belarusian authorities are working to diversify the inflow of energy resources to Belarus. Previous deals to supply Belarusian refineries with Azerbaijani oil have been successful. Widening such cooperation is essential for Minsk against a background of continually worsening relations with Russia. 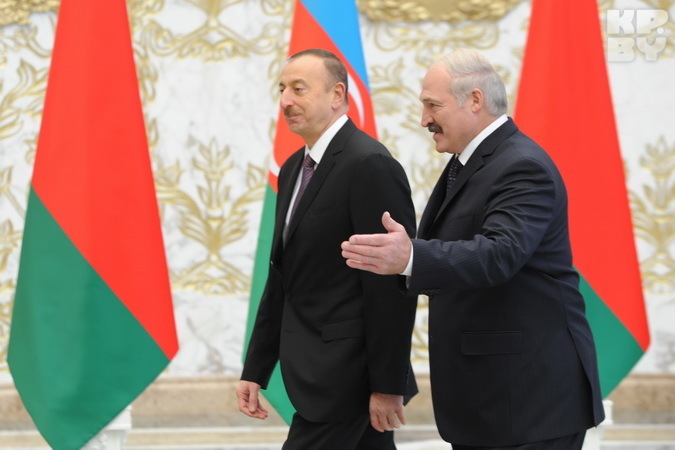 On the subject of propitious Belarusian-Azerbaijani projects in various spheres, one should remember that Lukashenka and Aliyev are on good personal relations. The Belarusian leader visits Azerbaijan as often as Russia and China, which means places high importance on ties with Azerbaijan. But in terms of the Azerbaijan-Belarus relationship, one can expect harsh rhetoric from Yerevan. It is important to remember that at one time Armenia proposed to exclude Belarus from the CSTO. From the end of 2016 to the beginning of 2017, Belarus and Kazakhstan both attempted to block the appointment of an Armenian representative to the position of CSTO head. Supplying strategic weapons to Baku will definitely not make relations between Minsk and Yerevan any better. One can’t expect Russia to publicly show its disapproval of Belarusian-Azerbaijani cooperation. Moscow’s options are to try to contain their partnership or to pressure Belarus. The reason for Russia’s indirect reaction is clear: Russia itself is the largest weapons supplier to Baku. But Armenian authorities seem to have ignored this fact. They can blame Belarus for destabilizing the region and undermining the national security of a CSTO member-state, but Yerevan will never make the same claims of the Kremlin. Indeed, especially not after having deployed Russian strategic weapons on its own territory. The development of cooperation with Azerbaijan plays extremely important role for Belarus in the light of the latest Belarusian security agenda. After the failure to carry out an information and public relations campaign during the “West-2017” military exercises and a number of provocations from Russia, Belarus is trying to restore its image as an independent actor. Thus, working together with Baku on strategically important projects should prove to the international community, including close neighbours, that Minsk is a true sovereign player on the international stage and a stable partner in the security sphere. Arguably, this is even more valuable at present than temporary economic benefits for Belarus.